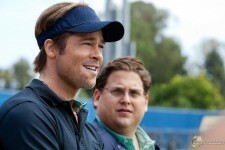 Based on a true story, "Moneyball" is a movie for anybody who has ever dreamed of taking on the system. Brad Pitt stars as Billy Beane, the general manager of the Oakland A's and the guy who assembles the team, who has an epiphany: all of baseball's conventional wisdom is wrong. Forced to reinvent his team on a tight budget, Beane will have to outsmart the richer clubs. The onetime jock teams with Ivy League grad Peter Brand (Jonah Hill) in an unlikely partnership, recruiting bargain players that the scouts call flawed, but all of whom have an ability to get on base, score runs, and win games. It's more than baseball, it's a revolution – one that challenges old school traditions and puts Beane in the crosshairs of those who say he's tearing out the heart and soul of the game. The Oscar Warrior: Why are Clooney and Pitt Campaigning? Why waste an Oscar on actors who really don’t need one?